Today, when you order "Tricky Business by Peter Eggink", you'll instantly be emailed a Penguin Magic gift certificate. You can spend it on anything you like at Penguin, just like cash. Just complete your order as normal, and within seconds you'll get an email with your gift certificate. 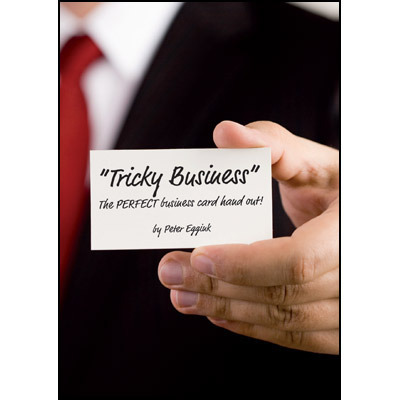 From the creator of the smash hits "Outcased" and "Exit", comes "Tricky Business"- Peter Eggink's best kept secret in commercial card magic! A spectator freely selects a card (NO force), and signs it across the face. The card is then shuffled back into the pack. Next, the magician introduces some business/address stickers, and explains that these stickers have actually a mind of their "own". One sticker is placed on the back of an indifferent card. Magically the sticker starts to "jump" onto random cards in the pack. Finally, the sticker vanishes in a visual and magical manner. 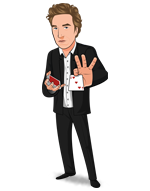 The magician explains that the sticker will magically "find" the spectator selection. As the magician says so, he spreads the deck and the sticker arrived -NOT on the back- but on the FACE of the spectator's selection, right across their signature! Of course the spectator can keep the card as an amazing unique souvenir! Tricky Business is visually stunning and HIGHLY commercial, which will create some long lasting memories. PERFECT for corporate events and Trade shows! Tricky Business is THE way to hand out your, or a company's "business card". PERFECT for Trade-Shows and corporate events! Works with ANY sticker with ANY Message! Make the sticker with message appear at the FRONT or BACK of ANY playing card! Comes complete with a special gimmick on Bicycle stock and a full color, photo-illustrated instruction sheet. Use your own deck of cards and stickers. The more creative you are, the more effects you are able to create using this clever "message applying system"!